Justice League Canada is DC's latest New 52 book, set in the distant, faraway lands of Toronto and Northern Ontario. When it comes to comic books, Canada really isn't known for its mainstream superheroes. Sure, we have Wolverine, but at the end of the day our heroes are silly, obscure, or both when compared to The Avengers or the Justice League. It's something Canadian comic fans just learn to accept, but within a few short months the status quo could be overturned entirely. 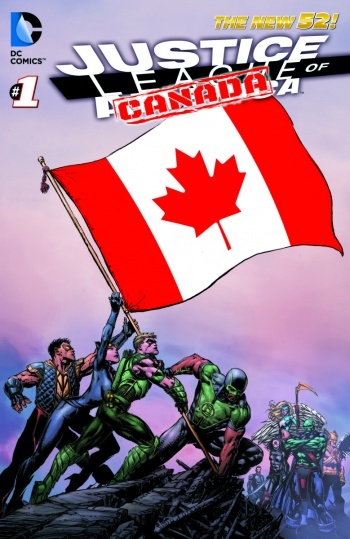 At Toronto's Fan Expo convention, DC Comics revealed that the Justice League of America will be uprooted from its home country, renamed, and given new headquarters in the Great White North. Written by Toronto-based Jeff Lemire with art by Mike McKone, Justice League Canada will feature the same cosmic-level threats of previous teams within the unconventional setting of Northern Ontario. "This is like my ultimate dream job," Lemire said. "It sounds like a joke and something like this would never happen, but it is actually happening, and I couldn't be happier." Justice League Canada is a rebranding of DC's Justice League of America book, complete with an updated roster and all-new creative team. According to Lemire, the idea was first proposed by publisher Dan Dido as potential fallout from New 52's current Trinity War event. "As a result of [Trinity War], without spoiling any of that story, there will be major changes in the Justice Leagues, and in the spring, the current Justice League of America team goes through a dramatic change and some of the pieces that are left behind will evolve into this new Justice League Canada team." The Canadian Justice League's full roster hasn't been revealed yet, but Lemire promises it will feature A-list heroes alongside new and lesser-known characters. For example, one confirmed team member is Adam Strange, the archaeologist turned science-fiction hero whose New 52 nationality will be reimagined as Canadian. Most important to Lemire, however, is representing Canada's authentic landscapes and cultural mindset. For that reason, most of JLC's action takes place in Toronto, while the team's headquarters are based in the James Bay and Moosonee area. "I do want to create a cool, rural Northern Ontario headquarters for Justice League Canada, and I don't want to spoil it yet," Lemire adds. "And it's not a hockey rink, I promise. Although, of course, it did cross my mind." "It really is just trying to make an honest portrayal of the places and the country and people that I know," Lemire explains. "That's why I'm setting it in Toronto and Northern Ontario, because those are the places that I really know well ... I'm just trying to create a genuine backdrop for these stories that are big and cosmic in scope, but are still really grounded in a real place. As long as I keep that focused, I'll probably avoid clichÃ©s, but sometime those clichÃ©s are clichÃ©s because they're true, so I'm sure some of that will slip in there."